Valuation analysts often search for ways in which to perform valuation analyses that provide conclusions of value that are reasonable and supportable. However, a supportable conclusion may not be immediately recognized as such. Valuation conclusions will be accepted as valid if the trier of fact is in agreement with the supporting methods, assumptions, and other inputs into the valuation and if this “evidence” points the reader or trier of fact to the same conclusions. Understanding where the Internal Revenue Service auditors are coming from is helpful to all valuation analysts whose work will come under their review. The Service’s Job Aid is a framework relied upon by the Service in its review of tax valuations. This discussion provides information that valuation analysts may consider while preparing their valuation analyses. 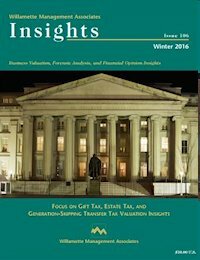 Over the past 20 years, the Internal Revenue Service has argued that valuation discounts applied in the transfer of family limited partnership and of other family-controlled holding entity ownership interests are “constructed” solely to avoid intergenerational wealth transfer, gift, estate, and generation-skipping transfer taxes. The legal profession and the valuation profession have argued the opposite position: that is, that valuation discounts applied in family wealth transfers are prudent, legitimate, and market-based. This discussion considers (1) proposed regulations with respect to Section 2704 and (2) the case for applying FLP valuation discounts. Valuation analysts often rely on the income approach to estimate the value of operating companies for gift tax, estate tax, and generation-skipping transfer tax purposes. Two closely held business valuation variables that analysts frequently estimate when performing the business valuation income approach are (1) the projected capital expenditures and (2) the projected depreciation expense. These two valuation variables are related to one another and to other income approach valuation variables. This discussion considers the relative valuation impact of capital expenditures and depreciation expense, especially with regard to various projected growth rate assumptions. A valuation analyst often has to value a controlling ownership interest in a closely held company for various taxation-related reasons. In such analyses, the analyst may initially conclude the value of a controlling, marketable ownership interest in the subject business entity. If this is the case, the analyst may have to apply a valuation adjustment to this initial value indication in order to conclude the value of the subject controlling, nonmarketable ownership interest. This discussion considers the factors that the analyst typically considers to measure the discount for lack of marketability (DLOM) related to the valuation of a controlling, nonmarketable level of value in the closely held business ownership interest. Valuation analysts are often asked to value noncontrolling, nonmarketable ownership interests in closely held companies. These valuations may be performed for gift tax, estate tax, generation-skipping transfer tax, income tax, property tax, and other taxation purposes. Depending (1) on the valuation approaches and methods applied and on (2) the benchmark empirical data used, these analyses may initially conclude the valuation of a noncontrolling, marketable ownership interest. In such instances, analysts often have to apply a valuation adjustment to these initial (i.e., marketable) value indications in order to reach the final (i.e., nonmarketable) value conclusion. This discussion summarizes the various factors that analysts typically consider in the measurement of a discount for lack of marketability (DLOM) associated with a noncontrolling, nonmarketable closely held business ownership interest. The valuation of a closely held corporation often has gift tax, estate tax, and generation-skipping transfer tax implications. In addition, the valuation of a closely held corporation often has income tax implications. In these tax-related instances, it is often important for the business owners (and for their professional advisers) to allocate the total enterprise value (or the total transaction consideration) between (1) the companyowned entity goodwill and (2) the individual shareholder/employee-owned personal goodwill. This discussion summarizes the valuation analyst considerations with regard to the elements of, the separability of, and the documentation of a shareholder/employee’s personal goodwill. Valuation analysts are often called on to value closely held entity goodwill for various gift tax, estate tax, or generation-skipping transfer tax purposes. Analysts may also be asked to value the business entity goodwill for income tax or property tax purposes. These entity goodwill valuations may be performed for tax planning, tax compliance, or tax controversy purposes. This discussion summarizes the generally accepted approaches and methods that analysts typically consider in the valuation of business entity goodwill. This Insights symposium presents a series of questions and answers between our Insights issue editor and a panel of distinguished and seasoned estate and trust counsel from across the United States. These legal counsel practice in the area of estate planning, trust administration, and transactional matters. These legal counsel share their experience and expertise with regard to judicial developments in estate planning, estate administration, estate tax compliance, and estate tax controversies. There are a variety of factors that buyers and sellers consider when deciding whether the acquisition of a 100 percent ownership interest in the target company should be structured as a stock acquisition or as an asset purchase. If the target company is an S corporation, there may be a federal income tax election that achieves the best of both worlds. In certain circumstances, the acquisition of the target company equity may be treated as a purchase of the target company assets for federal income tax purposes. That federal income tax election could favorably impact (1) the after-tax sale proceeds to the target company seller and (2) the after-tax cost to the target company buyer. The valuation of contract-related intangible assets is often an issue in matters related to income tax, gift tax, estate tax, generation-skipping tax, and property tax. This discussion explains the different types of contract intangible assets. This discussion summarizes the generally accepted approaches and methods related to the valuation of contract intangible assets. Finally, this discussion presents an illustrative example of the valuation of the hypothetical Taxpayer Corporation contract intangible asset. Corporate acquirers often acquire closely held target companies. In such acquisitions, it is common for the corporate acquirer to want to retain the services of the target company selling employee/shareholders. This discussion summarizes the many reasons why corporate acquirers would want to retain the selling employee/shareholders’ services during some post-acquisition transition period. However, both the structuring and the characterization of such transition period payments have income tax consequences both (1) to the corporate acquirer and (2) to the selling employee/shareholders. This discussion explains those income tax consequences to both transaction participants.